I have a 1500 elite and it turns on but doesn’t blow out any air at all how do I figure out what’s wrong and how do I fix it. Have an EdenPure Gen3 that turns on but the fan stays on low speed. What can I do to fix so it works like my other one. My heater is not blowing out any air, help???? I have the same problem, I am also an electrician, I took my unit apart and discovered that the neutral feed to the circuit board is not being sent to the heater elements. The elements or bulbs need both a hot wire and a neutral to work, I just got the unit today from my mom to take a look at because it had stopped working. while on, it heats yet operator panel is non functional… up or down arrows and any if the bottom 3 buttons no work and can not turn off unless I just pull plug. To start I have to plug unit in… please help. 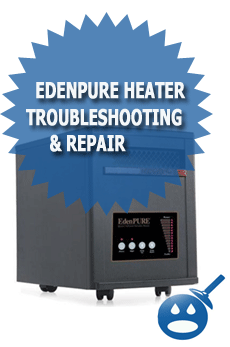 My Edenpure suddenly stopped working and tripped the breaker where it was plugged in. I was afraid to try it again. Is there any hope for this thing? Filter was clean….just POP. It was a gonner. Sometimes the bulbs or heater elements, when they go bad they can literally break in half inside the unit, if this occurs it can dead short, Trip the breaker, unplug the unit, take it apart and see if you have any bulbs in this condition, if you do replace them. Never work on the unit it if is still plugged in, you must unplug it first. My eden pure will not turn on, any suggestions? It worked perfectly til now.. The power light on the panel turns on but none of the buttons work to adjust heat ECT.. I have the same thing. Model A-4427. Found one bulb broken so I took it out. Did not replace it but I thought I could try turning it on. Still nothing. I se your initial post but I don’t see any reply. My Gen4 heater turns on all three heat elements have been replaced but I don’t get that bright red glow from front of heater. Is this an indication I need to replace the control board ? 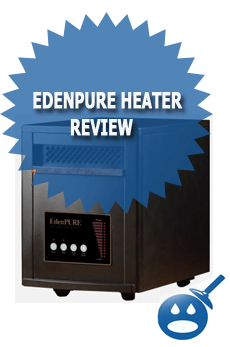 My edenpure heater has an issue with the plug & cord getting hot… afraid to leave it on for very long!! Heater only blows cold air. Any repair shops near La Plata MD. Or where to find instructions on how to replace heating elements and where to find those. I JUST REPLACED ALL THE BULBS IN MY EDEN PURE AND TWO BESIDE EACH OTHER WON’T WORK. THOUGHT I HAD TWO BAD BULBS SO I PUT BULBS IN THE TWO SPOTS THAT I KNOW WAS GOOD. THE OTHER FOUR BULBS WORK BUT TWO DON’T. WHAT COULD BE THE PROBLEM. I replaced all 3 bulbs in my us 1000. The heater started blowing hot air but then about 20 minutes later it was blowing cold again. What could be the problem? Our Eden Pure quit blowing hot air and the top of the heater got pretty warm. filter is clean. any ideas on what our problem is. Bought 2 units several years ago. Worked for one season. One unit does not heat, the other does not cycle. It blows hot air then shuts itself off and won’t come back on.